Casa Decrepit: Look! White Walls! 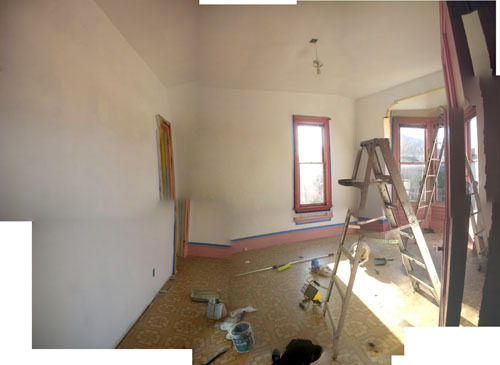 In more endless posts about how we painted a wall and look how clever we are, we have this progress picture, showing the ceiling fully primed and the walls mostly there. Tonight, when the primer finishes drying, we will tape off then paint the ceiling. Looking at my notes on the front parlour ceiling, we needed three coats of the pink paint to get good coverage (red tones are like that). With one hour between coats to dry, that means we'll spend all night tonight painting the ceiling and it will be done. We'll also finish priming the walls (which are a bit thin in spots) and the bay. That painting will happen tomorrow, unless we're up late enough to do one coat of the final colour. Fortunately, we have a couple of helpers to make the work go a little faster. Or to get in the way of the ladder. 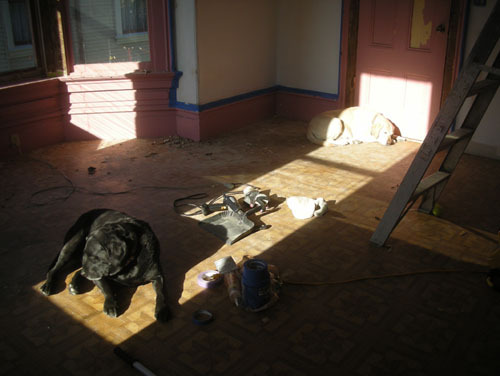 The dining room has the best sunbeam in the house, you see, so certain parts of the floor are set aside for doggie sunbathing.